Empire is once again excited to offer it's South Town Empire United I.D. 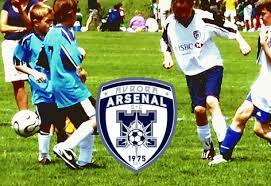 Summer Soccer Camp along with the Aurora Arsenal Soccer Club! Thise camp is open to all travel & premier soccer players ages 7-15. Age appropriate instruction and exercises will be the keys to a successful and enjoyable camp experience. The focus of this camp is on the core techniques necessary at this developmental stage. From fun games, to competitions that incorporate skill development, the players in this camp will be exposed to activities that expand their skill level and enlighten their understanding of the game. This will all be done in a fun and entertaining way. Players will be broken into age and skill appropriate groups. This program runs for three and half hours a day for four days. This camp is a fantastic opportunity for your son or daughter to come see what Empire is all about and work with some of the best local youth soccer coaches in all of WNY.